When unexpected water damage strikes, there is no time to lose. Take immediate action and call AF Environmental. Unexpected water damage is one of the most common forms of damage to a home or commercial building. Unattended sprinkler lines, burst pipes, failed appliances or foundation failures can all be the cause. For whatever reason, unexpected water damage can be overwhelming. Do not allow inaction to get the best of you. Studies prove that mold can begin to grow within 48 hours of the initial water loss- leaving you very little time to act. In the event of a water damage situation, you must act fast and with purpose. Do not let fear prevent you from mitigating the damage quickly. Educate your family and key personnel the location of the main valve. Shutting this off will prevent further water damage. Shut off the main electrical breaker next to protect everyone from electrical shock caused by hot wires or unsecured electrical outlets. Give us a call immediately. The faster you respond to water damage, the less time it will take to clean up. If it is safe to do so, move the furniture out of the affected area. This will provide greater access for our crews and technicians. Set aside any damaged contents such as rugs, furniture, curtains, clothing, tables, etc. We can restore those after the main areas of damage are addressed. Too many property owners fall into the trap of believing they can save money by cleaning up the mess themselves. They do not realize much of the damage of a water restoration event is hidden. Water that you can’t see seeps behind walls, under floor boards and behind cabinets. Also, the air could be holding a large volume of moisture in the form of humidity from the water loss. Unless the air is roughly a relative humidity of 45, you could experience secondary damage such as mold growth or structural damage. In addition, surrounding contents could be ruined as they continuously absorb the added moisture in the air. 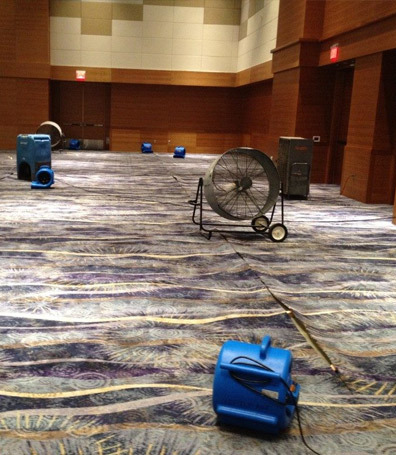 When unexpected water damage strikes your property, the next step is critical. Choosing a certified and professional company is key when ensuring your building is protected from mold growth or structural damage. Remember, not all water damage restoration companies are created equal. You need to choose a company who is licensed, and certified.